Professor Rogers says that suspense matters, as the students will be wondering what is coming next, and this will hopefully make them more inquisitive and thus drive them along the path to scientific enquiry. The Ambient Wood was a woodland full of various technologies for student pairs, with technology and probes, an explorative activity. You can read about the Ambient Wood here. The periscope idea ties videos into the direction that you are looking – a bit like Google Glass without a surveillance society aspect (a Woodopticon?). (We worked on similar ideas at Adelaide for an early project in the Arts Precinct to allow student exploration to drive the experience in arts, culture and botanical science areas.) All of the probes were recorded in the virtual spatial environment matching the wood so that, after the activity, the students could then look at what they did. Thus, a group of 10-12 year olds had an amazing day exploring and discovering, but in a way that was strongly personalised, with an ability to see it from the bird’s eye view above them. 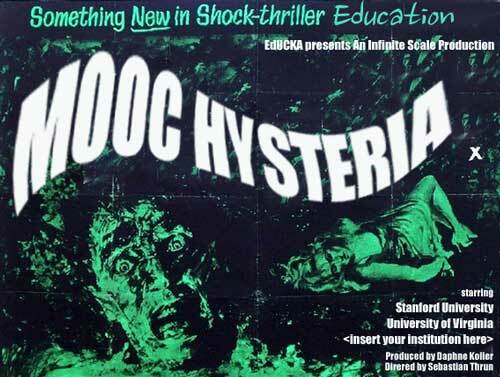 And, unsurprisingly, we moved on to MOOCs, with an excellent slide on MOOC HYSTERIA. Can we make these as engaging as the guerrilla lecture or the ambient wood? MOOCs, as we know, are supposed to increase our reach and access to education but, as Professor Rogers noted, it is also a technology that can make the lecturer a “bit of a star”. This is one of the most honest assessments of some of the cachet that I’ve heard – bravo, Professor Rogers. What’s involved in a MOOC? Well, watching things, doing quizzes, and there’s probability a lot of passive, rather than active, learning. Over 60% of the people who sign up to do a MOOC, from the Stanford experience, have a degree – doing Stanford for free is a draw for the already-degreed. How can we make MOOCs fulfil their promise, give us good learning, give us active learning and so on? Learning analytics give us some ideas and we can data mine to try and personalise the course to the student. But this has shifted what our learning experience is and do we have any research to show the learning value of MOOCs? Don’t reflect on or talk to their colleagues about it. Which is not what we want? What about the Flipped Classroom? Professor Rogers attributed this to Khan but I’m not sure I agree with this as there were people, Mazur for example, who were doing this in Peer Instruction well before Khan – or at least I thought so. Corrections in the questions please! The idea of the flip is that we don’t have content delivery in lectures with the odd question – we have content beforehand and questions in class. What is the reality? Still based on chalk and talk. Is it simply a better version of a bad thing? Are students more motivated and more active? Very labour-intensive for the teacher. How effective is this? Performance in PeerWise correlated with exam marks (Anyadi, Green and Tang, 2013), with active student engagement. It’s used for revision before the exams, and you get hihg-quality questions and answers, while supporting peer interaction. 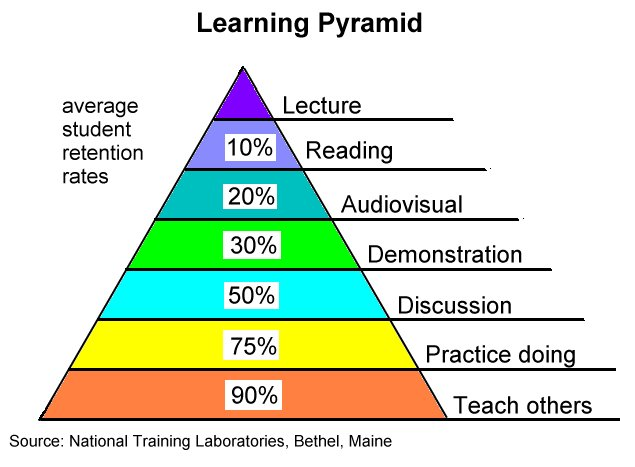 Professor Rogers then showed the Learning Pyramid, from the National Training Laboratories, Bethel, Maine. The PeerWise system plays into the very high retention area. One of the computers stopped working during a trial of the MaKey MaKey system with adult learners and the collaboration that ensued changed the direction of the work and more people were assigned to a single kit. Professor Rogers showed a small video of a four-person fruit orchestra of older people playing Twinkle Twinkle Little Star. (MORE KIWI!) This elicited a lot of ideas, including for their grandchildren and own parent, transforming exercise to be more fun, to help people learn fundamental knowledge skills and give good feedback. We often heavily intervene in the learning experience and the reflection of the Fruit Orchestra was that intervening less in self-driven activities such as MaKey MaKey might be a better way to go, to increase autonomy and thus drive engagement. What role should technology play in learning? Professor Rogers mentioned thinking about this in two ways. The inside learning using technology to think about the levels students to reach to foster attainment: personalise, monitor, motivate, flexible, adaptive. The outside learning approach is to work with other people away from the screen: collaborate, create, connect, reflect and play. Professor Rogers believes that the choice is ours but that technology should transform learning to make it active, creative, collaborative, exciting (some other things I didn’t catch) and to recognise the role of suspense in making people think. An interesting and thought-provoking keynote.